I love social media and I love publishing video. I already have a Youtube channel that I’m building and I’m very active on Twitter. But as of today, it’s time for something new. I decided to start a minivlog on Instagram. 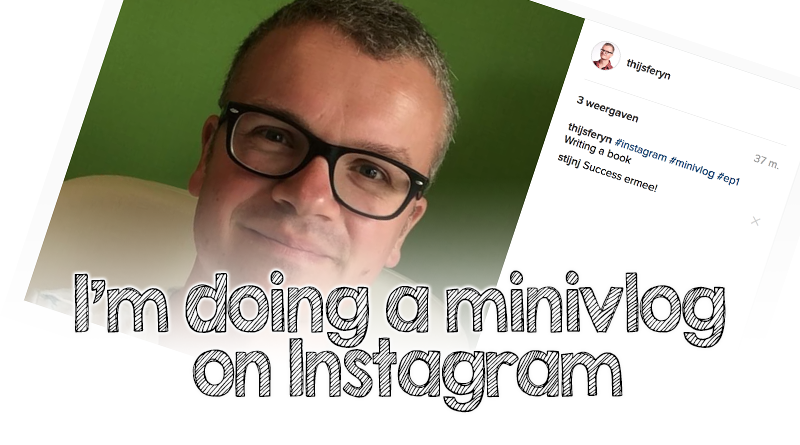 Instagram is a hugely popular platform and I’m looking for ways to do more with it. The fact that I limit these videos to 60 seconds will allow me to attract more people. There’s too much content on the web these days and people have short attention spans. In the beginning I didn’t really like Instagram. Why would you make pictures seem older than they actually are? Back then I couldn’t look beyond the filters. Now I can and now I see that it’s a platform that is centered around emotion and the visual aspect of social media. Ever since I made my Instagram profile public, I noticed that I could do really cool interactions with people. These interactions wouldn’t be possible on Twitter and would have less of an impact on Facebook. It was actually Gary Vaynerchuk who inspired me to do it. He’s all about Instagram and Snapchat. Gotta admit: I’m not ready to go all-in on Snapchat yet. Will probably do that in a couple of months, but let’s try Instagram first. Although I have a quite extensive camera and microphone setup, I’m trying to keep it simple for this one. On my Youtube channel, I’m doing the GoPro camera setup and the Zoom recorder with Shure mics. For the minivlog I’m using my iPhone. It does the job and does it quite well. Here it is: episode 1. Yes, I’m writing a book. I always dreamed of doing it, but was afraid of the work. Now a great opportunity presented itself and I’m really excited to get into it. I hope I can stay motivated. I hope I can turn this into a daily thing. As long as I can keep it short and sweet and the production time is super low, I’m sure I’ll be able to do it.